Metroline Security are focused on installing and maintaining fire and security products to protect homes and businesses throughout Kent. 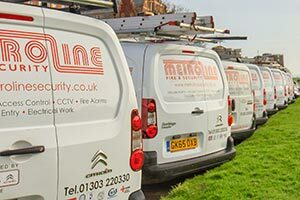 With an unrivalled track-record installing systems such as fire alarms, burglar alarms and CCTV solutions, Metroline Security are the perfect partner to look after your fire and home security needs. Established for over 20 years, the experienced team at Metroline Security have an exceptional track-record of working with a number of leading organisations such as K College, Dover College, Folkestone Academy, Ashford School, Saga, P&O Ferries, Brakes, Ashford Council, Leeds Castle, Fell Reynolds, Smith-Woolley & Perry, and Port Lympne Zoo. As important to us, however, are the thousands of residential customers that we have had the pleasure of serving over the past two decades. With an experienced team dedicated to providing the very best in service to residential customers throughout Shepway and East Kent, you can be assured that Metroline Security are the ideal choice of partner for your home security needs.